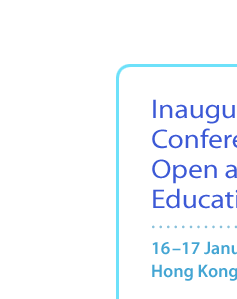 The Inaugural International Conference on Open and Flexible Education (ICOFE) will be attended by academics, professional experts and practitioners. As we are receiving notable contributions from international academicians, researchers, professionals and practitioners, we would like to recognize the best contributions to the theme of our conference ‘Making Learning Open and Flexible: Emerging Modes and Approaches’. The following information applies to the Best Paper Award. 1. One Best Paper Award will be presented to the author(s) of the best paper at ICOFE. 2. In order for a paper to be considered for the Best Paper Award, the following eligibility criteria must be met. • The paper should make a significant contribution to open and flexible Education, and should be well written. • The paper must be received by the deadline specified by the conference organizer. • The author(s) must notify the conference organizer as soon as possible if the paper submitted for consideration for the Best Paper Award has been submitted for publication or has been accepted for publication elsewhere. • The author(s) must present the paper at parallel paper session of ICOFE. 3. A selection panel for the Best Paper Award is established by the Organizing Committee of ICOFE. This panel consists of three experts from the academic field. 4. Each paper being considered for the award will be first evaluated by the Programme Committee of ICOFE and then by the selection panel. • Significance (25%): The contribution of the paper to the field with an emphasis on theoretical development, and/or educational practices. • Methodology (25%): The extent to which the methods and approach are appropriate. • Originality (25%): The extent to which the paper is innovative in terms of its sources of information, design, analysis and/or discussion approach. • Presentation (25%): The quality of the presentation in terms of accuracy, clarity, readability, and organization. 6. The winner will receive a certificate. 7. Details of the winning author(s) and paper will be invited to be extended and published in a related journal.